Comments: Evergreen conifer native to the Rocky Mountains from British Colombia to northern Mexico. This species has small, scale-like, green to blue-green leaves, red to brown bark that peals off in short strips to flakes. 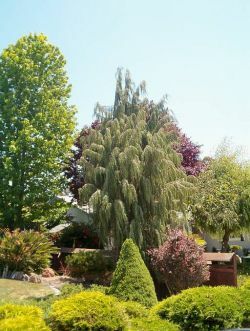 Tree is generally conical but the top broadens when it reaches maturity at about 60' in height. Weeping branches gives this tree the alternate name of Tolleson's weeping juniper.